I love how you've captured the sheen on the branches, the gloss on the leaves and shine on the fruits. The shining red berries are really eye-catchers! Hello, the red berries do pop. Lovely colors and image. Enjoy your day and the new week! Thank you, Eileen - have a wonderful week! Oh my goodness, what is this wonderful plant?! Thank you for the lovely photo and have a great week ahead! In all honesty, I don't quite know that this plant is. I'm not always that good when it comes to the names of nature - something I need to work on - but I did some research about this particular one previously and I have no definitive answer. 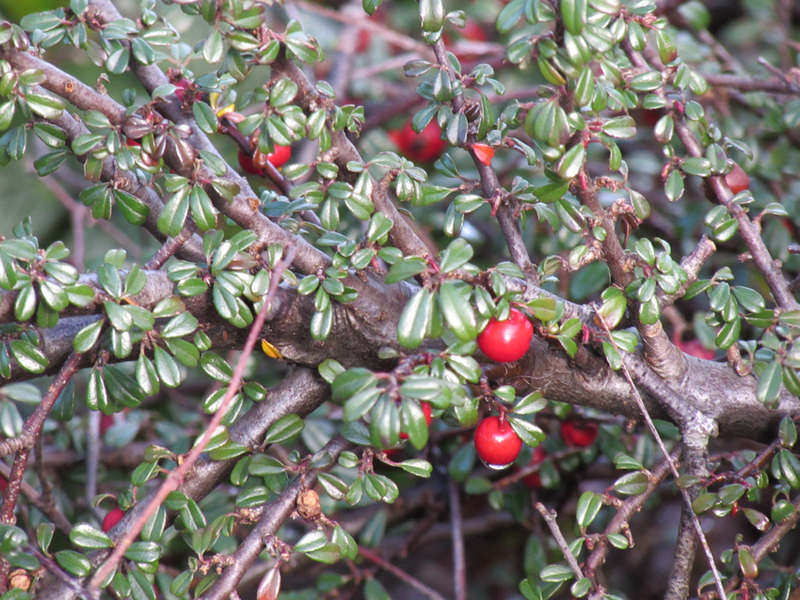 As you say, they do look like lingonberry, and it is quite shrub like, but there is also holly (picture four of this series was taken in the same place) entwined with what's pictured above and so I'm left none the wiser. It is quite beautiful though! Thank you - I hope you have a wonderful week! Very pretty - new growth as we head towards spring. It's wonderful with bursts of spring coming to light. others have mentioned on how the red jumps out at ya. You have solved the mystery - I didn't get a definitive on what this was, even after research!